Big Bang’s leader G-Dragon bought his parents a luxurious house. In online communities, there has been a picture spread around that says, “A pension that G Dragon presented with to his parents.” The picture shows a large scaled luxurious pension with a big swimming pool. From the photos, it appears that the modern house is as big as a museum! The furniture and interior design looked very unique and valuable. 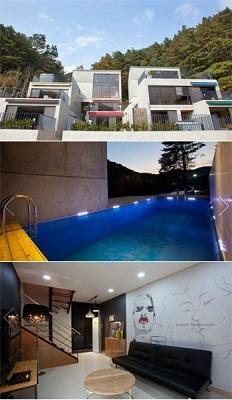 What makes this house so special is that there is G-Dragon’s dog’s mini house in the house! Meanwhile, Big Bang is to perform on November 23 to 24 in Osaka, Japan.